With respect, your Star Studdedness, do you ever have a problem when one of your obliging admirers doesn’t fully appreciate your charismatic charm? It appears his ‘good friend, Cher’, wasn’t aware of his propensity to ‘Cher and share for a ‘like’. 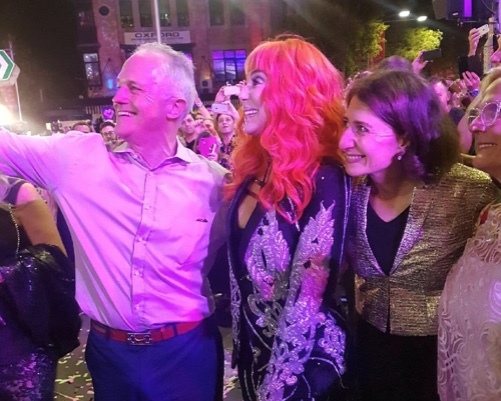 It seems only appropriate there was a ‘cultural cringe’ at a cultural festival, given his track record of being truly, completely and utterly pathetic. “I’m not sure what you mean. I just went and had a look at Cher’s playlist of songs. Soooo many titles would fit as a caption for Captain Tremble’s Fantastic Adventure with Cher. ….Cher did not who the man taking selfies was, maybe she thought he was the partner of Ms Bereikjilian…? Thank you for this Rossleigh. The selfie obsession is one of those niggling irritants that has been swanning around in the back of my brain for a couple of years. Is he collecting for his retirement memoir? Who does he show them to? Maybe it’s Lucy! He seems to share everything else with Lucy? Dear oh Dearie Me. I’d like to see a Selfless selfie. it’s narcissism – the whole idea of taking photos of yourself smacks of insecurity. Pathetic. Seriously, somebody should blow up all bloody selfies! What did we do before some cretin created selfies? I certainly would never “like” any picture with Talkbull, let alone a bloody selfie! Another great article Rossleigh, thank you!